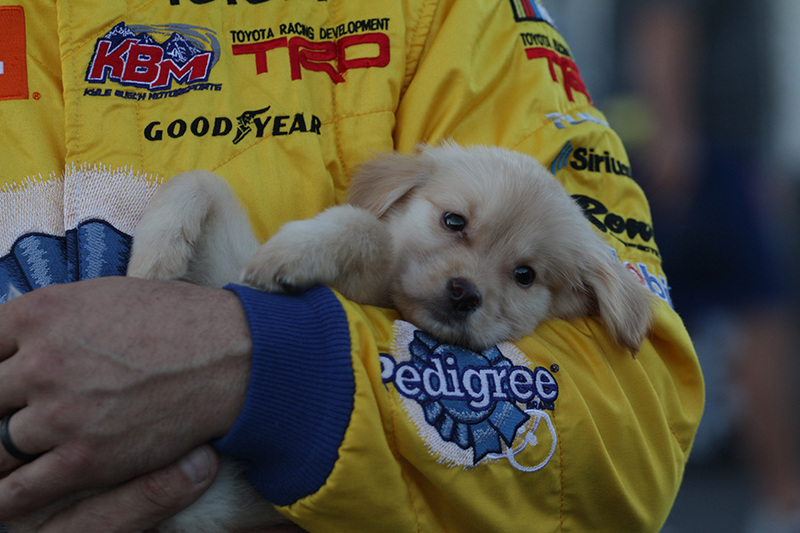 Fr8Auctions 250 pole-winner, David Gilliland, holds his new puppy Winston. After not performing any qualifying runs in practice this pole win came as a surprise to the driver of the No. 51 Pedigree Toyota for Kyle Busch Motorsports. After posting average practice times earlier today, David Gilliland, driver of the No. 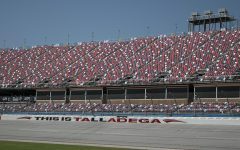 51 Pedigree Toyota, captured the pole for the Fr8Auctions 250 at Talladega Superspeedway with a top speed of 180.928 mph and a best time of 52.927 seconds. 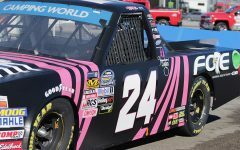 Noah Gragson, driver of the No. 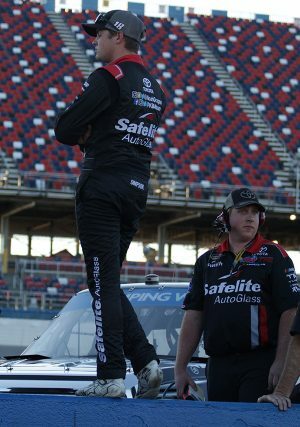 18 Safelite Toyota for Kyle Busch Motorsports, looks on as the other truck drivers qualify. 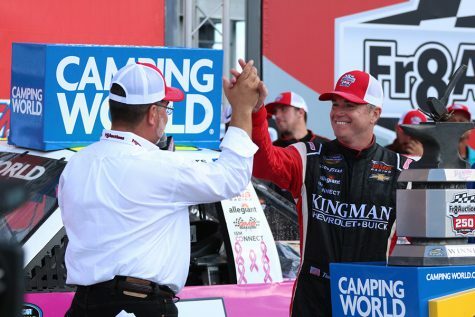 Gragson posted the 13th fastest time, missing the final round of qualifying by one position. Qualifying in the runner-up position was Spencer Gallagher, driver of the No. 2 Allegiant Chevrolet for GMS Racing, with a top speed of 180.55 mph and a best time of 53.038 seconds. 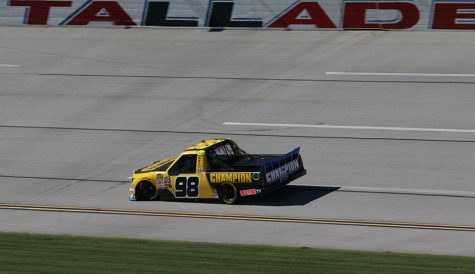 Gallagher scored second and first place finishes in practice showing the speed he has not only in pack-racking, but in single car runs as well. Timothy Peters, driver of the No. 25 Kingman Chevrolet for Ricky Benton Racing, qualified third after expecting to do well with a top speed of 180.489 mph and a best time of 53.056 seconds. Placing fourth was the driver of the No. 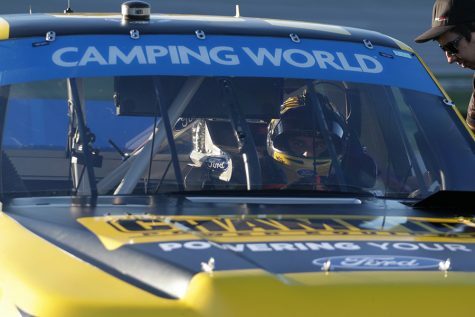 98 Champion Power Equipment/ Turb Records Chevrolet, Grant Enfinger, with a top speed of 180.183 mph and a best time of 53.146 seconds. Enfinger struggled in the practice session, but had his car fixed in time to run a successful qualifying effort. Finishing out the top five was Todd Gilliland, driver of the No. 4 Pedigree Puppy Toyota for Kyle Busch Motorsports and son of pole-winner David, with a top speed of 179.757 mph and a best time of 53.272 seconds. 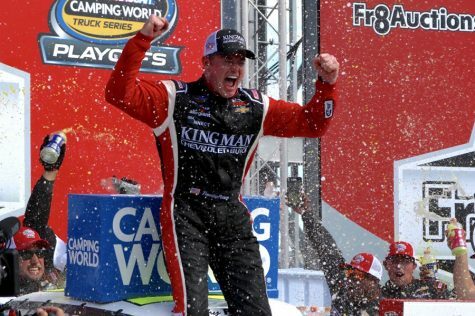 This was a impressive qualifying result for Todd as this is his first race at Talladega. 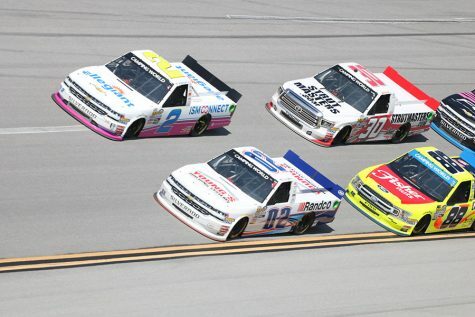 The results atop the scoring pylon may not reflect actual speed and handling each truck has. 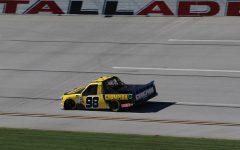 Qualifying at Talladega is ran in a single-file format, undervaluing the speed the trucks trucks can run in the pack-style racing format that will be used in the race. Leading the Georgia natives in qualifying was Austin Hill, driver of the No. 02 Young’s Building Systems/Randco Chevrolet for Young’s Motorsports, who scored a tenth place starting position after advancing to the final round of qualifying with a top speed of 179.538 mph and a best time of 53.337 seconds. Korbin Forrister, fellow Georgia driver and operator the No. 7 TruClear Toyota for All Out Motorsports, qualified 15th with a top speed of 178.507 mph and a best time of 53.645 seconds. Wendell Chavous No. 49 SobrietyNation Chevrolet for Premium Motorsports will start 32nd after a top-speed 173.507 mph and best time of 55.191 seconds. 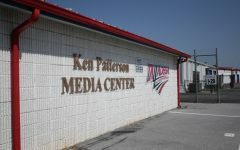 Fans can see how the race plays out by tuning into the Fr8Auctions 250 at 12 p.m. CDT on local Fox networks.